For twelve years Williams Construction has had the pleasure presenting Christmas gifts to the wonderful kids at both Pryor C.A.R.D Headstart locations. We would like to thank the staff for allowing us to help brighten the giving season for all the kiddos. 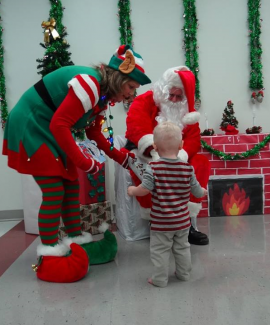 It is a delight to see all the smiles and hugs of excitement when they see Santa (played by Jay Hogan) and his Elf (played by Kathy Porterfield). We look forward to many years of Christmas smiles and hugs to come.